His superstar is likely to leave, and his stock continues to soar high, but with a set of dwindling options, it's possible difference-making manager Diego Simeone stays put at Atletico Madrid after all. LYON, France – At the final whistle of Atletico Madrid's 3-0 win over Marseille in Wednesday’s Europa League final, Diego Simeone came down from the stands–to which he had been banished after being sent from the touchline at Arsenal in the semifinal–and walked across the field. Shielding his eyes from the lights, he scanned a section of seats until he located the person he was looking for. He waved wildly, then performed a little dance. Only the Europa League? Not for him. This was Simeone’s second success in the competition and Atletico’s third, and his delight was clear. Yet the fact remains that this is only the Europa League. Atletico is only the 13th-richest club in the world by revenue, and that places certain limits upon him. What he has done with the club–a league title, a Copa del Rey and two appearances in Champions League finals as well as his Europa League successes–has been remarkable, but the question always lingers of how satisfied he can be operating on the fringes of the elite. There are few coaches as indefatigable as Simeone, but after seven years at Atletico, he must at least be considering his options. It seems all but certain that Antoine Griezmann, who scored twice in the final with two expert finishes, will leave this summer, and it may be a struggle as well to keep hold of goalkeeper Jan Oblak. 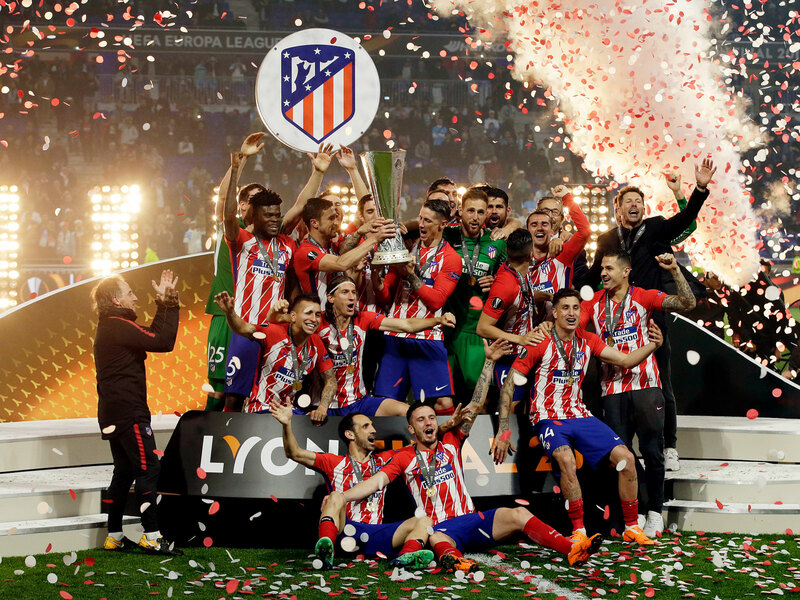 The constant churn of players, the need to sell every season, must be frustrating, even if an unusually large number of players seem to find their way back to Atletico. One of those, Fernando Torres, also looks likely to leave in the summer, with MLS his probable destination. That means significant rebuilding work is necessary, even without taking into account the fact that Gabi, a mainstay of the team during the Simeone years and the scorer of the third goal Wednesday, is now 34. Simeone has always dismissed talk of leaving Atletico. First, he said it was his responsibility to lead the club into a new stadium, which led many to think he would look to leave this summer after a year in the Wanda Metropolitano. But he has consistently said that he intends to stay and that the club is growing. Perhaps it is, but the constant sale of players means that progress will always be stop-start. Besides, regeneration is difficult. Atletico have done remarkably well to move from Torres to Sergio Aguero to Diego Costa to Griezmann, and the way young talents such as Saul Niguez and Thomas Partey have been integrated into the squad offers hope for the future. Atletico is very good at the process. But it is not something that can be relied upon–and if it goes wrong, as the case of Borussia Dortmund suggests, it can be difficult to recover. The super clubs can afford a mistake. They can write off a player and sign somebody else. Atletico cannot. Simeone is 48, still young for a manager, particularly one who has achieved what he has. His stock is high and would probably survive a poor season, but it’s hard to see how it could ever be higher than it is now. From that point of view, if he is ruthless in plotting his career, this summer may be the time to move on. But there is another issue, a slightly curious one, which is the matter of who would take him. A couple of weeks ago, it was clear there would be three big jobs available in Europe this summer: Paris Saint-Germain, Arsenal and Chelsea. Even before PSG appointed Thomas Tuchel, Simeone seemed an unlikely fit. PSG are (nouveaux riches) aristocrats in a league of the bourgeoisie. They demand football with a certain swagger. Simeone will not provide that. He is a fighter and a scrapper; his method demands commitment to the project and is rooted in an underdog spirit. Arsenal, perhaps, could have done with somebody in his uncompromising mold to stamp out the complacency that crept in during the latter years of Arsene Wenger. But that would have been a major upheaval and, besides, Simeone’s outspoken character is not necessarily something that would fit with a board that has, in recent years, seemed quite content to trot along quietly, watching the money roll in, rather than necessarily worrying too much about the difficult business of actually winning trophies. Mikel Arteta, anyway, now seems the favorite for that job. Which leaves Chelsea. Simeone’s style would not be a problem there; Chelsea’s greatest successes have been rooted in toughness and spirit. The bigger question, given the lack of long-term thinking at Chelsea, the frustration successive managers have felt with the cautious transfer policy, is whether there is any point in Simeone going there. It would only take one poor season to earn him the sack and leave him far worse off than he is now. Leaving Atletico for Chelsea would also mean giving up Champions League football. There’s also the sense with Simeone that he is not ruthless about his career, that sentiment plays a part. For him to leave Atletico would be a wrench far greater than for most managers leaving a club. It’s the team he played for and a team with whom he shares a world view. For all the questions he has faced and will continue to face, the likelihood is he will stay on another year.